WASHINGTON (CNS) — The president of the U.S. Conference of Catholic Bishops has called on President Donald Trump to ease the “onerous” contraceptive mandate of the Department of Health and Human Services under the Affordable Care Act because it violates religious freedom. Citing Trump’s pledge to ease the mandate during a White House signing ceremony May 4 for an executive order promoting free speech and religious liberty, Cardinal DiNardo lamented that after three months no steps have yet been taken to erase the HHS mandate for organizations that object to it for faith reasons. Religious charities, schools and pro-life advocacy organizations, the cardinal wrote, could face millions of dollars in fines from the federal government for not complying with the mandate. 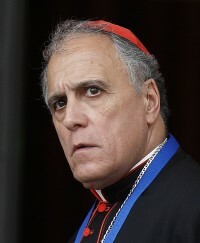 “The president’s promises were not just in his speeches,” Cardinal DiNardo said. “The text of the executive order itself directs the secretary of Health and Human Services to ‘considering issuing amended regulations, consistent with applicable law, to address conscience-based objections to the preventive-care mandate. “Yet the onerous regulations that are still on the books have not been amended,” he said. “Religious freedom is a fundamental right, not a political football. Freedom belongs to us by human nature, not by government dictate. A government that serves its citizens is one that respects the right to religious freedom,” the cardinal added. The column follows recent failed efforts by Congress to pass a law to repeal the Affordable Care Act. It also comes two months after the May 31 leak of a draft rule from HHS exempting religious groups from the contraceptive mandate. The draft was welcomed at the time by church officials and attorneys representing the Little Sisters of the Poor, one of the groups that challenged the mandate in the courts. The 125-page document remains under review by the White House Office of Management and Budget. It details objections to the Affordable Care Act’s requirement that employers cover contraceptives in their employee health plans despite their moral objections to such coverage. It would leave in place the religious accommodation created by President Barack Obama’s administration for nonprofit religious entities such as church-run colleges and social service agencies that are morally opposed to contraceptive coverage and can file a form or notify HHS that they will not provide it. The draft rule also would broaden this exemption to cover employers with religious or moral objections to providing coverage for some abortifacients. The new rule also makes it clear that insurers may issue separate policies to women whose employers are exempt from the mandate. The HHS mandate has undergone numerous legal challenges from religious organizations including the Little Sisters of the Poor and Priests for Life. A combined lawsuit, Zubik v. Burwell, made its way to the U.S. Supreme Court, where the justices in May 2016 unanimously returned the case to the lower courts with instructions to determine if contraceptive insurance coverage could be obtained by employees through their insurance companies without directly involving religious employers who object to paying for such coverage.